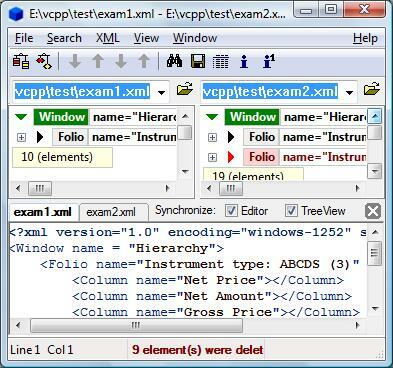 ExamXML Pro is integrated suite of visual XML tools for comparing files and folders for Windows 2000/XP/2003/Vista/7. It was specially developed for comparing, editing and merging XML files in an intelligent manner. It provides best-in-class features that distinguish ExamXML Pro from other XML comparison tools. ExamXML Pro supports folder hierarchy comparison, enabling you to compare entire directory trees. Ideal for users who want identify changes between XML files and modify differences on the fly. Unique to ExamXML Pro is its ability to ignore specified elements that match defined condition. In addition to the usual textual comparison ExamXML Pro can compare numbers in numeric format and dates in datetime formats. ExamXML Pro displays the XML document in a tree view, highlighting differences down to the level of elements, words or attributes, so that you can view exactly which attributes and elements have been added, modified or deleted. ExamXML Pro also provides a lightweight XML Editor for modification XML documents. Learn how ExamXML Pro simplifies the process of comparing and merging XML files. Download a free trial now! Find and replace multiple occurrences of text in one or more XML files. There is an option to find and replace multiple sets of words. There is also an option to find and replace within XML tags only, data only or both tags and data. Easily convert web pages into RSS feeds, Links2RSS. RSS AutoGen automates the process of generating RSS feeds from web pages, including full text descriptions, meta keywords, images, and rich content. Upload the feeds, submit them, and grow traffic. LightBox Advancer is a simple and useful Expression Web add-in with LivePreview function that helps to easily insert the LightBox into your web pages. It is designed to view the pictures in the popup lightbox-style windows.No hand coding is required. This site does not contain serial number, crack, keygen ExamXML Pro serial number : serial number is the simplest type of crack. A serial number(cdkey,product key,etc) is register the program as you may already know. a crack or keygen may contain harmful software. If you cannot find the exact version you want, just give it a try. for more information read .nfo/.txt/.diz file include in zipped file.